When you are preparing to take the examination, the best strategy is to study systematically and effectively. Remember that you are not only preparing for a test but also reviewing content that will be an important part of your responsibilities as an educator. The knowledge, skills, and abilities assessed on the examination are described in the competencies and skills that are available in Section 3 of this test information guide. The competencies and skills are based on relevant educational standards for the subject area (e.g., State Board of Education-approved educational standards, national standards). These competencies and skills represent the knowledge that teams of teachers, subject area specialists, and district-level educators have determined to be important for beginning teachers. Competencies are broad areas of content knowledge. Skills identify specific behaviors that demonstrate the competencies. Percentages indicate the approximate proportion of test questions that represent the competencies on the test. The following excerpt, taken from the FTCE Professional Education Test, illustrates the components of the competencies and skills and test blueprint. 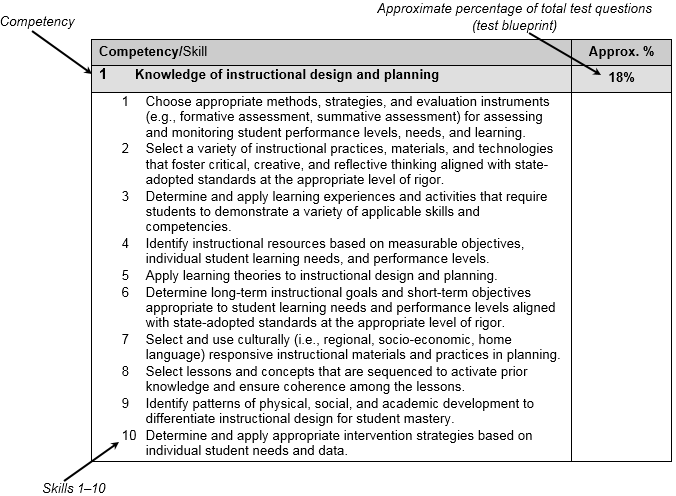 Graphic of a sample competency, Knowledge of Instructional Design and Planning. The competency is numbered 1, and has an approximate percentage of 18 percent, which represents its weight toward the overall test score. Below the competency and weight is a numerical list of the related skills. The following steps may help you prepare for the examination. Adapt these suggested steps to suit your own study habits and the time you have available for review. Step 1: Read the competencies and skills for the examination you are preparing to take. Step 2: Read the sample questions and attempt to answer them. The sample questions represent the type of questions you may find on the examination. These sample test questions will acquaint you with the general format of the examination; however, these questions do not cover all of the competencies and skills that are tested and will only approximate the degree of examination difficulty. To help you prepare for your test, each sample multiple-choice question is preceded by the competency it measures and followed by the correct response. On the actual test, the competencies and correct responses will not be given. After answering a sample multiple-choice test question, review the correct response. If you answered a question incorrectly, you may need to do some additional studying of the content covered by that competency. For tests or subtests that include an essay component, you will be presented with two sample topics and asked to select one of the topics as the basis for your essay. In addition to the sample essay topics, this section of the test information guide includes the field-specific scoring criteria that raters will use to evaluate your response on the actual exam. You may wish to consult with faculty at your educator preparation program to determine the best time for you to take the exam. In your coursework to date, you should already have mastered most or all of the content that you will see on the exam. At this point, the best preparation is to identify: 1) your areas of strength and weakness (the sample questions in the test information guide may provide you some idea of the areas on which you might focus); 2) any content with which you have had difficulty in the past; and 3) any other content you have not yet mastered. You should then systematically and effectively study areas you have not yet mastered. Identify the most appropriate resources. These may include your basic textbooks from relevant courses; your class notes and other assignments; textbooks currently in use in Florida elementary and secondary schools; and publications from local, state, and national professional organizations. This test information guide also includes an annotated bibliography that provides general references that you may find useful in preparing for the exam. Each resource is keyed to the competencies and skills used to develop this examination. Develop a study plan schedule. A carefully thought-out plan will enable you to cover the material you need to review before your test date. Consult your advisor. To determine whether the courses you have taken covered the breadth of content that will appear on the exam, you may wish to review the competencies and skills with your advisor. Before meeting with your advisor, you may wish to complete the Test Competencies and Skills to Courses Taken Worksheet to determine whether the knowledge and skills tested by a competency were covered by a particular course. If there are any competencies not yet covered in your coursework, your advisor and professors may be able to help you identify additional classes you should take, or additional materials that you can study from, to improve your knowledge in those areas. While concentrating your studies on your areas of weakness, you should also be sure to do some additional preparation addressing the content covered in the other competencies. Remember, your score on the test/subtest is based on the total number of questions that you answer correctly; therefore, improvement on any competency will increase your total score on the test/subtest. One study method that many students have found to be effective is "PQ4R," or "Preview, Question, Read, Reflect, Recite, Review." After reviewing the competencies and skills, refer to the annotated bibliography for a list of the most important and most comprehensive texts pertaining to the competencies and skills. Once you have obtained the appropriate study materials, apply the six steps of the PQ4R method as described below. Question: Based on the appropriate test competencies and your preview of the study materials, think of specific questions to which you would like to find answers as you study. Write these questions down and use them as a guide as you read. There are many strategies for taking a test and different techniques for dealing with different types of questions. Nevertheless, you may find the following general suggestions useful. Plan ahead. Go into the examination prepared, alert, and well rested. Plan to arrive at the test site early so that you can locate the parking facilities and examination room without rushing. Take proper identification (as described in the "Identification Policy" ) with you to the test site, dress comfortably, and bring a sweater or sweatshirt in case the room is too cool for your comfort. Pace your work. The test session is designed to allow sufficient time for you to complete the test/subtest/section. At any point in the test/subtest/section, you will be able to see how much time you have remaining. Go through the entire test/subtest/section and answer all the questions you are reasonably certain about. If you have any difficulty answering a question, you may mark it for review and return to it later, but you must respond to the questions, including those marked for review, during the allotted time. For examinations with multiple subtests or sections, you will only be able to review items within that subtest or section. Once you complete a subtest or section, you will not be able to return to that subtest or section of the test. You will be alerted to this during testing. Before completing a subtest or section, go back and check every question. Verify that you have answered all of the questions and that your responses are correctly entered. Read carefully. Read each question and all the response options carefully before selecting your answer. Pay attention to all of the details. Determine the "best answer." Your response to each multiple-choice question should be the best answer of the alternatives provided. When you are not certain of the correct answer, eliminate as many options as you can and choose the response that seems best. Guess wisely. Your multiple-choice results will be based on the number of questions you answer correctly. Attempt to answer all questions. You will not be penalized for incorrect responses; it is to your advantage to answer all the questions on the exam, even if you are uncertain about some of your choices. Respond to constructed-response assignments fully and clearly. If you are taking an exam with an essay component, be sure to read and respond to each part of the assignment. It is important that your response fully addresses the topic.